Hi Steemians, wish you have a beautiful and successful trading year! ETH has touched the $160 level and currently showing some retracements from that point. 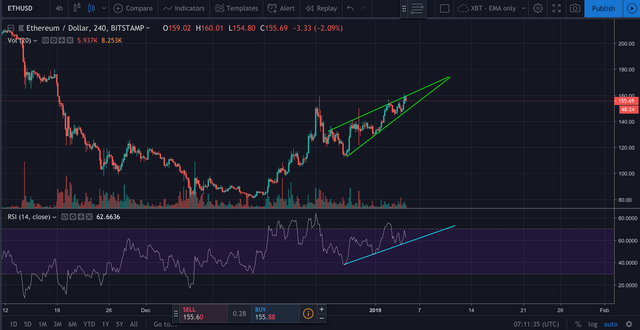 From the USD chart, we can see that ETH is still trading inside an upward wedge with tighter space, reaching the peak. Furthermore, the RSI indicator showed that the supported line had been tested three times. As mentioned yesterday, the situation is still in danger mode for ETH. We might see a further rise to $180 or near $200 level, but then, a considerable drop is coming. 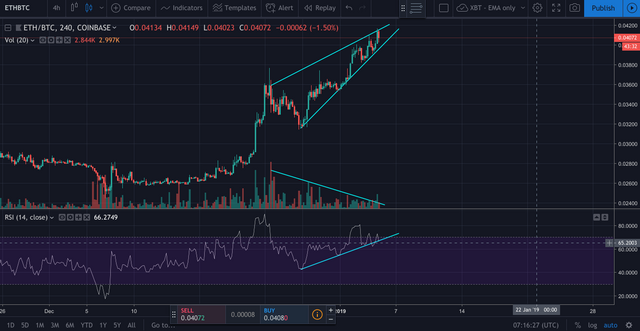 Sharing similar characteristics of the ETH/USD pair, the ETH/BTC is moving in an upward rising wedge with a high chance for a drop from here. For short-term trader: Try to set up Short from $170 level with profit booking half of your order every $10. Your UA account score is currently 2.187 which ranks you at #21616 across all Steem accounts. Your rank has dropped 27 places in the last three days (old rank 21589). In our last Algorithmic Curation Round, consisting of 206 contributions, your post is ranked at #202.